Government, Global Pharma, Academic, and Biotech Researchers expand use of the Proviasette™ frozen biospecimen device. In addition to existing users of the Proviasette,™ which also includes global pharmaceutical companies, academic medical centers, and major NIH initiatives, Provia added many new customers in 2013. In 2013, there was a rapid increase in high quality biobanks that chose to adopt the Proviasette.™ New customers included three global pharmaceutical companies, two premier children research hospitals, a globally recognized medical center in Washington, DC, two NCI-designated cancer centers, a nationally recognized research center, and multiple biotech companies. 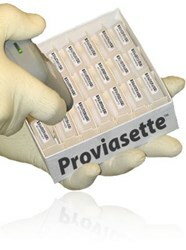 Provia Labs introduced the Proviasette,™ a revolutionary bio-specimen storage container, in 2011. The Proviasette™ improves upon a design used by leading academic and commercial laboratories around the world to efficiently store hundreds of thousands of snap frozen and OCT-embedded biospecimens in -80°C or vapor-phase liquid nitrogen (LN2) freezers. Well-designed and GMP-manufactured, the dual polymer construction of the Proviasette™ prevents the cap and base from seizing at low temperatures. It is virtually indestructible in a lab setting, and is certified 95kPa compliant. Highly space efficient, the Proviasette™ enables up to 8,400 samples to fit conveniently into a standard -80°C freezer. Proviasette™ is the optimal way to maintain the integrity and tracking of stored bio-specimens, especially high-value cryopreserved bio-specimens used in clinical research. Grace Century FZ LLC is an International research and private equity consultancy located in Ras Al Khaimah, (north of Dubai) in the United Arab Emirates (UAE). Grace Century specializes in “game-changing” life science and health related private equity projects. For more information, visit: http://www.gracecentury.com. Headquartered in Littleton, MA, Provia Laboratories, LLC is a healthcare services company specializing in high-quality bio-banking (the collection, transport, processing and cryogenic storage of biological specimens). Provia Labs offers the Proviasette™ product range for use in bio-banking environments to improve sample logistics, security and quality. The company manages and promotes its own bio-bank for a dental stem cell banking service, Store-A-Tooth,™ which gives families the option to store stem cells to protect their children’s future health and take advantage of advances in stem cell therapies. Provia advises industrial, academic and governmental clients on matters related to the preservation of biological specimens for research and clinical use. Provia Labs is a member of ISBER, the International Society for Biological and Environmental Repositories, as well as ESBB, the European, Middle Eastern and African Society for biopreservation and biobanking. For further information about Proviasette,™ contact Provia Labs at 1 (781) 652-4815 or pminor(at)provialabs(dot)com, or visit http://www.proviasette.com.